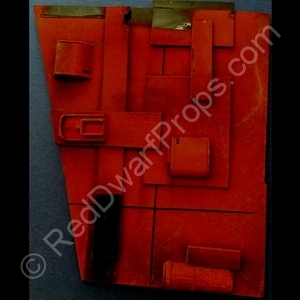 Red Dwarf ship wreckage from the episode Demons and Angels. This right now is the centre piece of my collection. 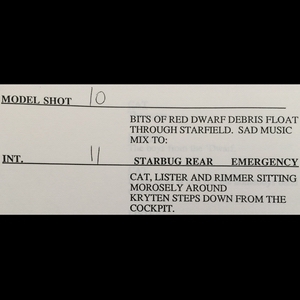 It was acquired in 2014 directly from the Red Dwarf Model Unit Director of Photography. The story of the Red Dwarf ship model is as interesting as it is kind-of-funny. The original 8 feet long Red Dwarf model was destroyed when it fell off a shelf in the BBC production office! A 2nd model was re-built for series V, and after ensuring that enough library footage of the model was gathered for any needs for future episodes, it was then spectacularly blown up in episode 5 of series V. The latter series used either the library footage of the model, or CGI to portray the ship. Demons and Angels (or “High and Low”, to give it it’s working title), follows the story of the crew messing about with a triplicator – a device that can create copies of objects. Although what it actually does is to create a “high” version of the object, and a “low” version. Things of course go pear-shaped, as they end up causing the Red Dwarf ship to explode, just before managing to make a hasty exit in Starbug. To film the explosion scene, the Red Dwarf ship model was positioned with a black drape 14 feet above and filmed with the camera facing up. 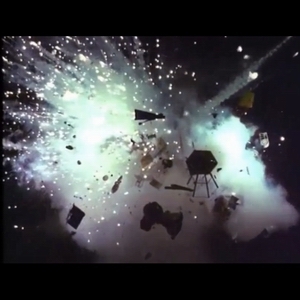 Rigged with pyrotechnics and filmed with a Photosonics Camera running at 360 frames per second, the explosion gave the appearance of debris moving outwards as if in zero G.
Peter Tyler, the Model Unit Director of Photography, had collected 4 significant pieces of wreckage. In 2004, 2 of these were acquired by a collector in the U.S, 1 by a collector in the UK; the remaining piece he held privately until I recently acquired it. I have an enormous amount of respect for Peter and his team. The effects they created with only the typically tight BBC budget available, are nothing short of amazing. I am proud to say that this piece is accompanied by a hand written letter from Peter authenticating it. 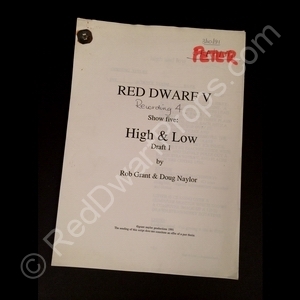 I also have in my collection an early matching script from this episode, under the working title of “High and Low”. Tagged 1992, Demons and Angels, High and Low, Peter Tyler, Red Dwarf ship, Script, Series V, VFX. Bookmark the permalink.